Post subject: Hey AoO, Nice website! Serve under respective Chief of the Army as commander for all assigned Officers. No restrictions to gaming or campaigning in ongoing CSA/USA matches. Serves to coordinate Corps and Divisional commands, may promote Officers to Corps Commands upon approval of the CoA. Assigns all newly graduated West Point 1st. Lts. to Corps or Divisions. Monitors Corps web pages to ensure that data is up-to-date. Administration points (15) are to be awarded to AC's on a monthly basis. Report to the CoA any useful information for publication on Web site. There is no AoO website. There is no AoO tavern. They don't exist. I don't understand why this is so. Frankly, in terms of everyone's responsibilities in this club, I think it sets a bad precidence. My CO just sent me an email asking me to round up my division for Muster. Well, what if I don't have time to do it? Or what if I just plain don't feel like doing it? Why should I? Maybe the link is not updated and the website itself is splendid....could be a variety of things so maybe an offline email rather than a public proclamation would have been the way to get the ball rolling...[;)] Just a thought. <br />Maybe the link is not updated and the website itself is splendid....could be a variety of things so maybe an offline email rather than a public proclamation would have been the way to get the ball rolling...[;)] Just a thought. Maybe I did that already. Just a thought. I found this at the bottom of the oob page. That's 16 months ago for those of you that are counting. and it's blank. What's the problem? People don't always have time for everything or the skills for it, let alone volunteers to do things. Also a big difference between AC and DC. That's the page from when I was AoP commander. Now I'm a divisional commander. Go look at the divisional duties. Webpage is not one of those duties. But when I was AC I went and brought frontpage, learned how to use it, found freespace for the Army page and made a webpage, then I found freespace for a tavern and built that too. You know why? Because I was told that if I volunteered for that job that's part of what I was volunteering for. Also, I wanted my army to have pride and pride starts at the top gentlemen. If an officer doesn't have enough pride to volunteer for a job that he can handle, lead his men by example and get the job done, well, then he's not really volunteering for the job now is he. Look, I'm not trying to single out the AoO head, I have a lot of respect for that officer. I really do. I am trying to single out the Union's lackadazicle approach to command and how it needs to be addressed. If we don't have enough officers for these jobs then maybe we need to cut back on the number of positions. 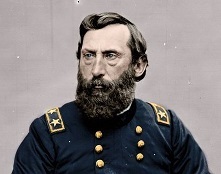 Specifically, I am formally calling for either A) The Dissolution of the Army of the Ohio or B) That the command issues in this army be aggressively and properly addressed so that every officer in the Union army knows exactly what is expected from them when the assume command of a particular unit. Noone gets free passes because the men under them suffer when those passes are given. Look, I lightly addressed this with the Union commander and was brushed off. Then I went to the Union only board where I was ignored so now it's in the M-D tavern where basically I'm one hand clapping in the forest again. But if this ship doesn't get on course again. It will crash. I'm not a sky is falling kind of guy as a rule but when I look across the Mason-Dixon line at our Confederate gentlemen I see that we in Blue can do a better job as the example is right there. In fact, there are a couple armies in the Union army that are run tight as well. I want the rules that are in place to be enforced for everyone. That's really all I'm asking for. I think I addressed this in my response to Lt. Durant. Thank you for taking the time to read the posts on this and reply. I do appreciate it. Sincerely. You know, I've just about had it. You've pursued this diatribe throughout multiple boards and now you're dragging it into the main board. If you have a complaint with the way that General Sands is doing his job, take it to proper channels. You have no call to attempt to humiliate Ernie, mock him or otherwise insult him. Contact Ernie, contact the Commander in Chief, contact the cabinet, but do it privately, not to demean him before the entire club. I find your behavior to be ungentlemanly, offensive and divisive. <br />You know, I've just about had it. I'm glad to see you are insulted. Really, I am. Maybe, after the emotion has cleaned out a bit, you will actually THINK about what I am trying to say. I think Ernie is a great officer and some of the things he did when this army was in tremendous turmoil about a year ago were GREAT things. Things that a levelheaded intelligent leader brings to the table. But pardon me for saying so, The AoO is not being run according to the very rules He is helping to formulate. I'm using the AoO as my example but I could bring up multiple problems of a similar nature for us to consider in many Union armies. I think it's a big problem. I think putting your head in the sand and ignoring it is not solving the problem and I think I really don't care what you think of me for bringing it out. Look, I understand that I am actually putting my own beloved Army of the Potomac on the chopping block by calling for a redution in the number of Union Armies but I think it's a necessary evil. So go ahead, insult me. Take everything the wrong way. See what I care. But start thinking about this. It is important.